The small picturesque village of Flåm is situated in the Aurlandsfjord, an arm of the 204 km-long and up to 1308 m deep Sognefjord. Flåm has a population of around 400 inhabitants. In 1980 most of the locals were farmers; today most of the people work in the tourism industry or on the railway. Flåm is one of the most popular cruise harbours in Norway. 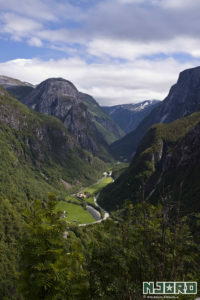 The origins of its flourishing tourism date back to the late 1800s, when large numbers of English tourists or “salmon lords”, came to fish in the Flåm river. These travellers laid the foundation for hotels to be established and encouraged a steady stream of tourists who have continued to come up to the present day. The village is the end station of the popular Flåm Railway. The Flåm Railway is one of the world’s steepest railway lines on normal gauge and its twisting tunnels that spiral in and out of the mountain bear witness to the most daring and skilled engineering in Norwegian railway history. The Flåm Railway is one of Norway’s major and most spectacular tourist attractions and the train journey between Bergen and Flåm provides travellers with some of the wildest and most magnificent scenery in Norway. On the 20 km (1 hour) long train ride, you can see rivers that cut through deep ravines, waterfalls cascading down the side of steep, snow-capped mountains and mountain farms clinging dizzily to sheer slopes. Along the route, the Flåm Railway also makes a short photo stop at the beautiful Kjosfossen waterfall.